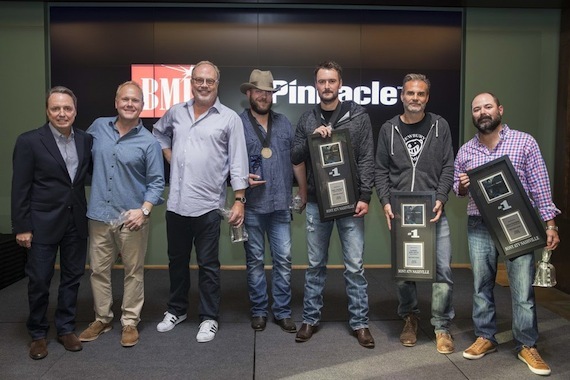 Pictured (L-R): Pictured: (L-R): BMI’s Jody Williams, Sony ATV’s Troy Tomlinson, UMG Nashville’s Mike Dungan, BMI songwriter Jeff Hyde, BMI artist Eric Church, Q Prime Management’s John Peets and Little Louder’s Arturo Buenahora Jr. Photo: John Russell. With “Record Year,” EMI Nashville artist Eric Church and co-writer Jeff Hyde dropped the needle on another No. 1 hit. The industry gathered at BMI on Tuesday afternoon (Oct. 11) to wax poetic about the achievement. Since then, the tables have turned. Hyde is the utility player in Church’s touring band. The two men are also co-writers on “Smoke a Little Smoke,” “Springsteen,” and “Kill a Word.” In addition, “Record Year” received CMA nominations in the single, song and video categories. Church is also nominated for male vocalist and album (Mr. Misunderstood). At the party, Little Louder Music’s Arturo Buenahora Jr. spoke on behalf of Hyde, while Sony/ATV’s Troy Tomlinson represented Church. Producer Jay Joyce was not in attendance. John Peets of Q Prime Management, Brandi Simms of CMA and John Shomby of Country Radio Broadcasters also addressed the industry audience. Ron Cox of Pinnacle Bank shared news of a donation to Chief Cares, a nonprofit administered by Church and his wife Katherine. After that, UMG Nashville’s Mike Dungan delivered the label’s so-called “Impaler Award,” an small obelisk given to artists on the roster who reach No. 1. Church referred to his radio promotion team at EMI Nashville as the best in town. “I never make the job easy. I know that,” he said, eliciting more laughter. “It wasn’t that funny,” he quickly added.